Push a button. Record a moment. Look at that moment on a piece of paper or on a computer. You have recorded time. You have recorded history. You have captured culture! You are a photographer! A photograph is a record of light. Photography is a word derived from the Greek words photos (“light”) and graphein (“to draw”). A photographer is an artist who looks at the world through light’s recording of form, event, sequence and emotion. Do you have a camera? Have you ever wondered how it works? These days cameras seem to be everywhere. They are used as scientific tools of documentation and discovery, artistic tools of personal expression and as a means of recording our lives and relationships. The idea that taking a photograph could be seen as nearly miraculous may seem ridiculous to those of us who carry tiny cameras around all of the time inside of our cell phones and record daily moments. If we take a little time, however, to wonder how a camera works, and to think about the strangeness of capturing an image of what is in front of us through recording of light, we, too, may realize just how remarkable photography is. When did people move from drawing history or sharing stories about history to capturing visual moments in photographs? The art and science of photography has been developing (ha!) since the time of the ancient Greeks. Modern photography as we know it, however has its origins in the 1820s when discoveries about the light sensitivity of certain silver compounds allowed two French men, Nicéphore Niépce and Louis Dagurre, to “etch” an image with light onto a metal plate. These became known as daguerreotypes. Early daguerreotype cameras were quite a bit larger and heavier than those commonly used today. The photographic plates used to be exposed to light for a long time before an image would appear. It was many decades before taking a photograph of a person did not require the subject to remain still for several minutes at a time. All of these factors kept cameras from being owned by people who were not professional photographers. By the end of the 1800s, however, this would all change. 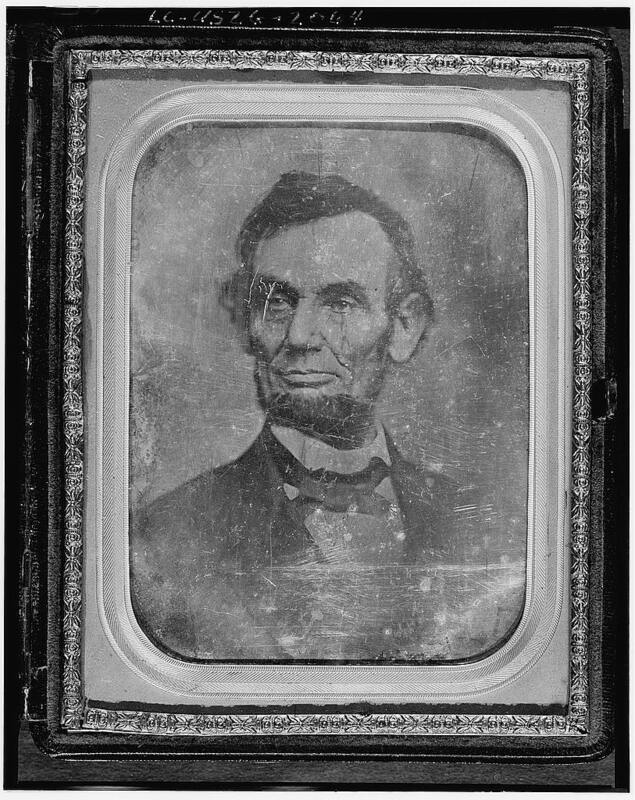 Research three famous daguerreotypes of Abraham Lincoln. 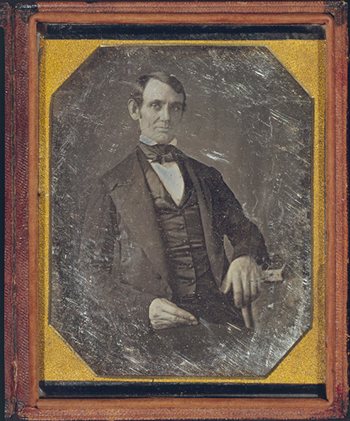 One of the most famous was of the Congressman Abraham Lincoln and later President Abraham Lincoln. Write about what you think he may have been thinking about while sitting still for so long. Submit a copy of his daguerreotype with your paragraph typed below it. Who would you like to photograph? A modern camera is made up of three parts: a lens, which lets in reflected light and redirects it; a chemical element (this is the film in non-digital cameras or image sensor in digital cameras); and the camera body. Inside the camera are two devices that control the amount of light to which the film or image sensor is exposed. These are the shutter and diaphragm. The shutter acts like a little door that controls the amount of time that light is allowed to go through the lens and onto the film or image sensor. The diaphragm is a hole that light passes through after it has gone through the lens. Changing the size of the diaphragm changes the amount of light exposure. Coordinating shutter time and the aperture (size of the diaphragm) can create many different effects. A flash, or light source to illuminate subjects is included in most cameras today. 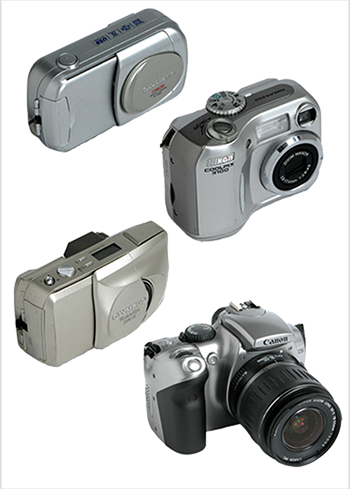 In addition, cameras may use light sensitive film, or a memory card. Film is processed in a dark room, while photos can be uploaded digitally onto your computer or at a store to be printed. 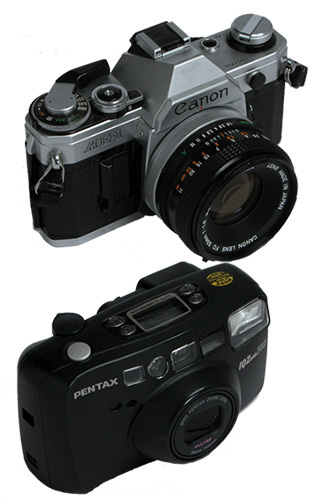 Draw (or photograph) a few different camera types and label their key parts. Photography means to draw with light. The amount of light passing to the film or sensor determines what is known as the exposure. The diaphragm or the opening and closing of the aperture modifies the quality of light. The shutter speed determines how much time light is let into the camera. Direct sunlight creates great contrast in photographs. It can also cause glare. High contrast photographs reveal more forms than they do texture and refined details. Shooting at dawn or dusk when the light is low and diffuse, or on a cloudy day will help to capture more detail. Take a photograph of the same view in the morning, midday, and at dusk. Look at the difference between detail and texture, form and contrast. What is it about black and white photographs that attract us? Is it a moment of art instead of the casual photo? Is it because it asks us to look at the artistic composition, the content, the texture and the detail all in their exquisiteness? Is it because it reveals the artistic intent in greater clarity? Is it because it is not how most of us who see the world in color see? Black and white photographs can be strong and powerful and they can be soft and gentle. While black and white images preceded color images, many photographers choose to photograph in black and white today. Without color to move our eye around a picture, we tend to look more directly at the composition, the texture and the content. Create and compare black and white photos of details, portraits, scenes and landscapes. 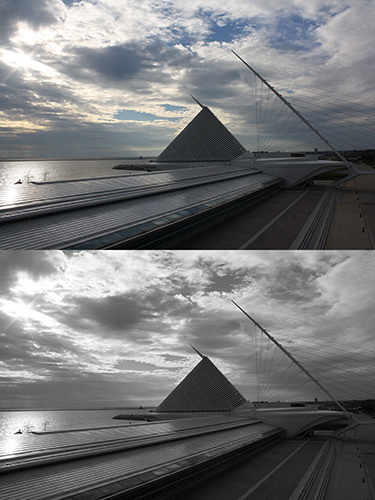 Compare the black and white image to the color. Take notes on which one you are drawn to and why. Portraits, people, landscapes, scenes- every picture tells a story. Single images are a powerful tool to telling stories. They can capture time, place, people, personalities, action and our emotion. Photographic images are powerful visual tools. To photograph something, someone, or someplace take reflection and evaluation. It also takes timing. Often, it requires travel. Photographers develop ways of looking and seeing the world and then share it with us. Look at the work of Ansel Adams, Charles Brady, Henri Cartier Bresson, Dorthea Lange, Edward Weston, Alfred Steiglitz, Victor Skrebneski, Jerry Uelsmann or research and find a contemporary photographer. Write about their life, what they sought to photograph, what story they were trying to tell. Include photographs of the photographers and their subject matter. A photograph is the recording of what to make an image? Which part of the camera controls the amount of light that enters the camera? Shutter speed controls the length of time the light sensitive film or sensor is exposed. Composition is important in taking photographs. Smithsonian Why Don't People Smile in Old Photographs?